GOLD PENFOLDS DINNER - The Gold Penfolds Dinner cruise was an amazing experience. Our hostess, Bella, was truly exceptional and a credit to the company. Her attention and service was second to none. The food itself was fine dining at its best, with the entertainment creating a relaxed and ambient atmosphere. This experience has left us with a fantastic memory to complete our 50th wedding anniversary year. SAILGP CLUB PASS - Thank you Captain Cook Cruises for the excellent day you provided on Saturday. Staff were friendly, where nothing was a problem for them. Food and drinks were for a very high standard. The position of the boat provided us with the best views of the race. Excellent job, well done. CAPTAINS DINNER - We had an amazing time. It was my mother's 65th birthday and the whole crew (including the band) made it special, with the wait staff telling the band to sing Happy Birthday, and co-ordinating it with the kitchen to have a cake and candle brough out at the same time. The drinks came to our table quickly, our questions were answered with a smile, and everything was just smooth and relaxed and the ambience created by the staff was spot on. Thanks for a great night. BUFFET LUNCH - Just wanted to say how much our group enjoyed the Seafood Buffet Lunch Cruise. We really appreciated the delicious food and the excellent service by the staff. We also enjoyed the interesting commentary, even though many of us have lived in Sydney a long time, I'm sure we all learned something new! The fact that it was a fabulous summer day was icing on the cake. HARBOUR STORY PREMIUM - The 2 hour cruise around Sydney Harbour was undoubtedly the best harbour tour we have been on. Staff were extremely welcoming and friendly and the 4 individual pre-packaged little cakes were delicious, as was the coffee. Of particular note was the cruise commentator. Her knowledge, humor and clear, distinctive voice made the cruise the best experience. The Captain gave us a wonderful, leisurely tour. The 2 hours on board left more like 3! A perfect way to spend a Sunday morning. LONG LUNCH - From our table we had fabulous views, and my gluten free dietary request had been observed and special bread was available to me. The trip itself was spectacular and such an amazing way to see the beautiful harbour. It was my husband's birthday and the staff kindly arranged for a sparkler to come with his dessert, something he was very touched by. Thank you Captain Cook Cruises, we would highly recommend you to anyone thinking of taking a cruise. BARANGAROO FAST FERRY - A big thanks to Paul for his fantastic commentary on the ferry from Manly via Watson's Bay to Barangaroo. It was an excellent talk and he was extremely friendly and welcomed everyone on board with a huge smile! HARBOUR STORY - We joined your morning Harbour Story Cruise and it was a fantastic experience to us. The vessel is spacious and the story telling part is very interesting & impressive. We learnt a lot about Sydney Harbour from the commentary. NEW YEARS EVE - I was on John Cadman II on NYE and I couldn’t have had a better time. Everything about the cruise was perfect, the staff were polite and all retained their sense of fun and humour. Thanks to the crew for a great way to see in the New Year. NEW YEARS EVE - It was one of the greatest highlights in my life. The service, the kindness and dinner on board was fantastic. To see the fireworks from the ship was great and there are no words to describe it. Thanks again. MANLY - BARANGAROO FAST FERRY - The trip was both quick and enjoyable as Paul give an excellent commentary on highlights along the way. I have lived in Sydney almost all my life but I found Paul’s commentary very interesting and made me feel that I should explore our local history more closely. Thanks Captain and thanks Paul. LONG LUNCH - Booked the Long Lunch Cruise to celebrate my husbands 65th birthday and we were not disappointed. Food and staff were both excellent, and the drinks package I would highly recommend if celebrating a special occasion. 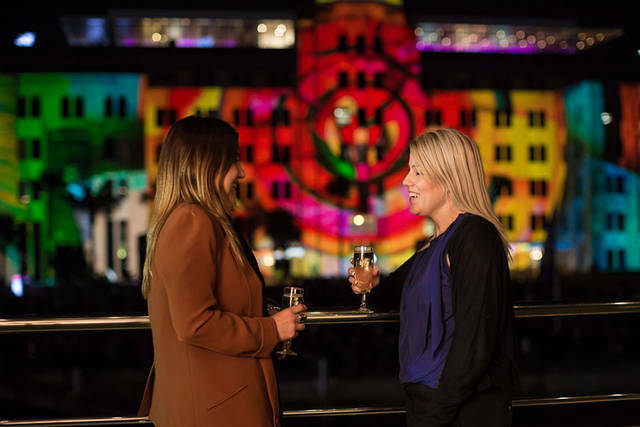 Cruising around Sydney Harbour with a glass of wine in hand is a perfect way to celebrate. LUNCH & GOLD DINNER - On behalf of my wife and myself I wish to express our thanks to your staff for their welcoming and friendly service, the meals and the wines I can only describe as being perfect. Thank you for providing two memorable occasions cruising on Sydney Harbour. VALENTINES DAY - What an amazing night we had! The staff were pleasant and professional, and the food tasted amazing. During the cruise I proposed to my partner on the top deck so we are definitely going back home the special memories from Valentines Day. VIVID DINNER & DRINKS - Captain Cook staff just keep getting better the more we sail with them. The meal was very good and the lights were magnificent. This company and this tour are highly recommended. Thank you Captain Cook Cruises for a great night. VIVID LIGHTS - What a wonderful way to view the beautiful vivid displays along the harbour, and saved us many hours of walking amongst the crowds. Really enjoyed our cruise and it was good value for money. Highly recommend. NEW YEARS EVE - I would like to compliment all your staff on New Year's Eve for the outstanding service aboard your Captain Cook III. We booked for 4 people and we all had an excellent time. It was extremely well organised and executed together with excellent food and the service was second to none. Thank you so much and I will definitely recommend anyone doing this cruise. BUFFET LUNCH - So worth it! The food was delicious and the service was fabulous. Kudos to Edward who was attentive and very kind. I will be happy to recommend to anyone looking for a Harbour Cruise. NEW YEARS EVE - Had three trips with Captain Cook Cruises. The second one was the best - New Years Eve cruise and champagne dinner whilst watching the fireworks. Fantastic night. SUNSET DINNER - Excellent. Good value for money and on board personnel were courteous and efficient. Would definitely recommend. HIGH TEA - Our experience was 10/10. Food served was second to none and cruise well above our expectations. We have a large family of 7 and staff were great - our kids all left with smiles on their faces. Next time we are in Sydney, we will definitely be revisiting. CHRISTMAS DAY LUNCH - As Sydney-siders, this was a memorable occasion for us. We love Captain Cook Cruises & have done many of your cruises. We just wanted to congratulate you on your high standard of service, food & attention to detail. It is a credit to all involved. CHRISTMAS DAY - I would like you to know how great my experience was on the Sky Deck Lunch. The service, food and wine was unbelievable. MOTHER'S DAY LUNCH - We have just had our cruise on Mother's Day 8/5/16. We had a wonderful wonderful time !!! The staff were fantastic, friendly and attentive and the food was such great quality - the oysters and prawns were so tasty. Really good quality. NEW YEARS EVE - I was a guest on Matilda 3 and it was another memorable evening. A good variety of food, unrestricted view of fireworks, staff & experience all excellent. HOP ON HOP OFF - Excellent view of the harbour and surrounds. Friendly and courteous staff. Overall value excellent. We booked the 48 hour pass to see the harbour & thought that one day would not be enough. Goat Island - Nice walk around the island. Circular Quay - Spent the afternoon at The Rocks. Plenty of shops and restaurants. Walked around from the bridge to the Opera House. Fort Denison - Always wanted to go on the island since I was a child. Taronga Park Zoo and then we stayed aboard and cruised around to Watson's Bay and back to Circular Quay. Luna Park and then back to Darling Harbour. The tour guide on the ferry was very good and informative. Excellent view of the harbour and surrounds. Friendly and courteous staff. Overall value excellent. CHRISTMAS LUNCH - Congratulations on an excellent luncheon. My family and myself enjoyed the day immensely. Your staff were all courteous, friendly and very helpful. The overall appearance of the Club Deck was very festive and well presented. Your chefs certainly excelled themselves with their presentation of the food so all in all a very happy day. Again, congratulations and we look forward to being able to join you on another occasion. SUNSET DINNER - You really cant beat the experience cruising along the harbour with a glass of wine taking in the million dollar views. The staff were attentive, the food good quality and the wine free flowing. Nothing was a hastle for the staff and make sure you take the time to get up from your table and head to the roof top to take some sunset snaps. WHALE WATCHING - "(The whales) were magnificent, graceful, breathtakingly awesome and there were lots of them." 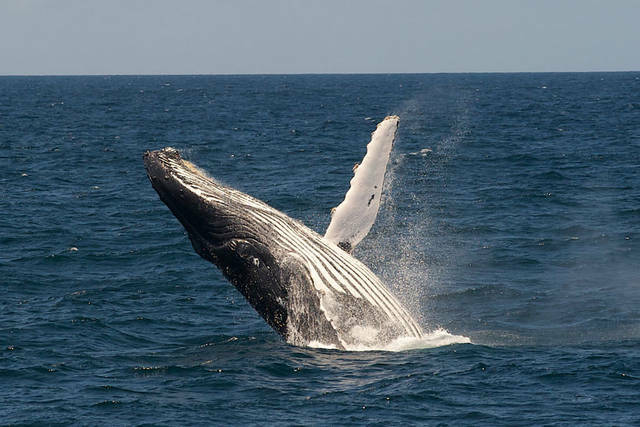 Visit Lyn's blog to read her great post Whale Watching in Sydney with Captain Cook Cruises. GOLD DINNER - It was perfect and the staff were so pleasant and attentive. The meal and wine were delicious - the perfect way to spend my 50th birthday.... I will certainly be recommending this to anyone who has an occasion to celebrate. SUNSET DINNER - Great view, great food, the on board photographer took one of the best photos of our holiday. Great view of the Opera House and Bridge. Great food - smoked sea trout, barramundi, chocolate and orange pots, wine and champagne as part of a set dinner. On board photographer took one of the best photos of our holiday. VIVID DINNER - Cruise was delightful, food and service impeccable. Music and vivid lights were outstanding. Will do it all again. GOLD DINNER - My husband and I had a blast! The food, service and atmosphere was beyond what we expected. I have already told so many people how good it was. TOPDECK LUNCH - We had a wonderful time on the top deck a la carte cruise. Beautiful day. Great service, lovely waitress and beautiful food. GOLD DINNER - An absolute must do. Attentive staff with a lovely attitude, delightful food and wonderful entertainment. While enjoying the night lights of Sydney Harbour. We opted for the Gold Dinner and couldn't have been happier with it. It met and exceeded our expectations and we wouldn't hesitate to do it again. We did it as a winter special and went early in the week, which meant we had much of the ship to ourselves and felt positively spoilt. The Winter special offers excellent value for money. Our thanks for such beautiful memories. GOLD DINNER - If we used the TV series My Kitchen Rules scoring system, we'd give you an 8 for the dinner and a 10 for the staff, atmosphere and Sydney's beautiful harbour. Quite a good score, and definitely an event that we'd recommend. STARLIGHT DINNER - The Starlight dinner cruise was fantastic. Food was amazing, service and atmosphere just great. As it was a get together with four friends we have decided to do it again next year and a big vote for the cruise. STARLIGHT DINNER - A big THANK YOU to Lissa who looked after us last Saturday night. She was only too happy to help us out in celebrating our Mother's 50th birthday! STARLIGHT DINNER - Thank you for a perfect evening. Everything was delightful, great food, friendly, helpful staff & the bonus of watching the Diamond Princess cruise ship leave Circular Quay. A wonderful night. SUNSET DINNER - Just wanted to say thank you. My partner and I took the Sunset cruise on Saturday 11th Feb. We had a wonderful time, food was great, and would definitely recommend. SUNSET DINNER - Thoroughly enjoyed it.The cruise, food, and service could best be described as excellent. A sincere thank you to your company and staff. We have recommended your Company to others. CAPTAINS DINNER - My mum had the most amazing time and didn't want to get off the boat! A lady called Debbie looked after us and she was great, in fact, everyone was great! CAPTAINS DINNER - Our party of four, including two guests from Canada thoroughly enjoyed the evening. The cruise was smooth, the service good and the entertainer most pleasant. DINNER CRUISE - It was absolutely amazing and wow what a way to see the city. The food was well presented and a great variety of choice, that is always an issue with certain people however you cater for all tastes and offer something for everyone. GOLD DINNER - Thank you for a wonderful dinner on Sydney 2000. We had a most memorable night celebrating our anniversary. HIGH TEA - My mum is particularly hard to buy for, so the High Tea at Sea was the perfect Mother's Day gift. It was the perfect end to a day of shopping and gave us an opportunity to catch up over a glass of bubbles and a cup of tea while enjoying one of Sydneyís best assets. The food was top notch too! ZOO EXPRESS - These guys are professionals and know their business very well. Highly recommend them for any trips on Sydney Harbour. Apart from the drop to Toronga Zoo, they provided a tour around the harbour on return. The journey and commentary was quite good. These guys are professionals and do know their business very well. Highly recommend them for anything trips around sydney. CAPTAINS DINNER - Thank you for a great night. The service was fantastic, food & entertainment great, & views breathtaking. 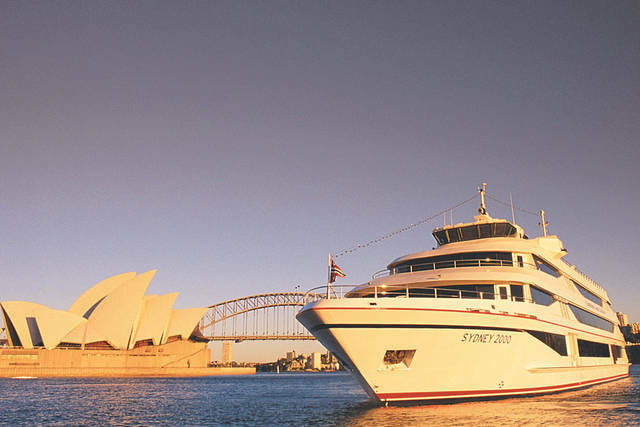 Book now and save over 30% on a great range of Sydney Harbour Dining and Sightseeing Cruises.